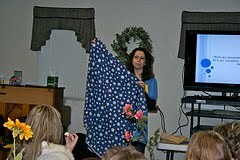 The moms in Carelink gathered on February 22nd for a presentation by Susan Perkins, who is a Library Media Specialist at Maize Middle School, and a mom of three young children. Susan remi nded us that reading begins years before our children can read a book on their own. 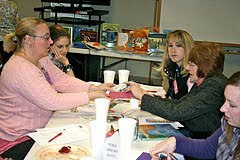 Reading is a part of language development and that begins as early as infancy, when your child hears the spoken word. So we need to read to our children! Susan challenged those of us who have sai d, "I'm just not a reader." to stop believing that. Reading doesn't have to be books and novels. Reading includes the newspaper, online articles and magazines. The more you do it, the better you get, so make it a habit. Susan also said, one of the best ways you can prepare your preschoolers and kindergarteners to learn how to read is to teach them manners and how to obey authority. Having children who can do this in the classroom allows the teacher to focus on the curriculum and teach instead of manage misbehavior. Don't worry! Your child doesn't have to know how to read before Kindergarten! - Practice how to care for your books before you go. As well as proper library behavior. - Find pictures online of the library to view before you go. - Do some puzzles before looking for books when you arrive. 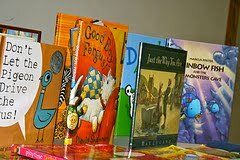 - Avoid trying to find books for yourself when your children are with you. - Go alone to get a library card, so you aren't waiting with the children growing impatient. - Create a special reading space: bean bag, tent, bookshelf corner in the room. - Have a special item your kids can use when reading: flashlight, bookmark, hat. 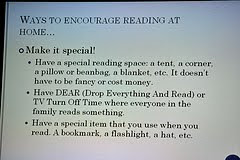 - Have designated DEAR time (drop everything and read) for the entire family. 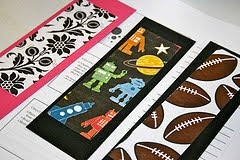 Susan brought scrapbooking supplies and gave us time to create special bookmarks for our children. 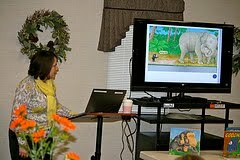 She also gave us handouts of her presentation which included dozens of great websites for teaching phonics, learning to read games, research & homework websites for older children, places to find Christian books for kids and resources for reading books online. We have extra handouts available for those that missed the meeting. One other resource she mentioned was the Kansas Library Card, http://www.kslib.info/, which is an online resource where you can download audiobooks, some music and videos and other items. You can set up an account with the KS Library Card site using your Wichita Public Library card. A list will be passed around at the March Carelink meeting for anyone wanting Susan to register them for a KS Library Card.